Toshiba is a Japan-based popular electronics brand that initially manufactured personal computers. Presently along with other products, it also manufactures hard disks and surely they are performing well. The highlighting part of the Toshiba 500GB Canvio Slim Hard Disk is its amazing speed for data transfer. The price of Toshiba Canvio Slim 500GB is INR. 17,748. The hard drive has USB 3.0 interface for faster transfer speed, however, it also supports USB 2.0 without any issues. It works on all formats from Windows XP and above. When it comes to its speed it is lightning fast and can go up to 1 Gbps. A very good point about this hard disk is that it does not require any external power to function. The hard disk is a complete package with its remarkable aesthetics and design. As the name suggests, the Toshiba Canvio Slim is a sleek box with only 9mm thickness. It weighs only 147 grams making it feathery to carry around. In addition, the compact design is sturdily decreasing the possibilities of any physical damage or data loss. In conclusion, the Toshiba 500GB Canvio Slim is an amazing hard drive to use and it is a durable product. You can always categorize it according to your storage requirements and price range. 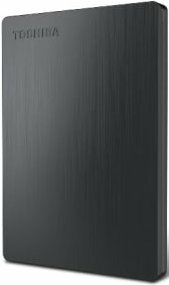 Toshiba 500GB Canvio Slim USB3.0 Hard Disk full specs and reviews as of Apr 2019. Buy it here!